I don’t cook with curry powder nearly enough, and I’m reminded of that fact every time I do use it. Because you’ve got so many spices mingling in one blend, it doesn’t take much else to make a dish delicious. That’s why I love Singapore noodles. Clarification: that’s why I love to make Singapore noodles. The fact that I love to eat Singapore noodles should require no explanation. I’ve ordered the dish dozens of times in restaurants, always thinking it had to be really complex, because it’s such an amazing array of flavors and textures. All that complexity is actually in the curry powder. One spice, which is actually a blend of a bunch of spices, all powdered up and ready to sprinkle on your food and transform it into something delicious. That’s what curry powder is, and that’s exactly what it does to these Singapore noodles. Madras curry powder is the variety I opted to use in this dish. It’s a particularly spicy blend, resulting from the copious amounts of chili powder contained therein. I happen to like spicy, but if you don’t, I’m sure any basic curry powder would be equally delicious. So, just how simple is this dish? It’s about as basic as a simple veggie stir fry. In fact, it is a simple veggie stir fry, just with noodles and curry powder. The noodles require just a short soaking time, so it doesn’t take as long as many other pasta dishes do. After soaking, they’re stir fried with the veggies and curry powder, along with a little garlic, ginger and soy sauce. I added a little turmeric, which, I’ll be totally honest and say was for the heightened yellow color it adds (because that’s the Singapore noodles trademark, right?). For the veggies I decided to go with napa cabbage for crunch, and red bell peppers for just a touch of sweetness, and for heft and protein I threw in some pan-fried tofu. 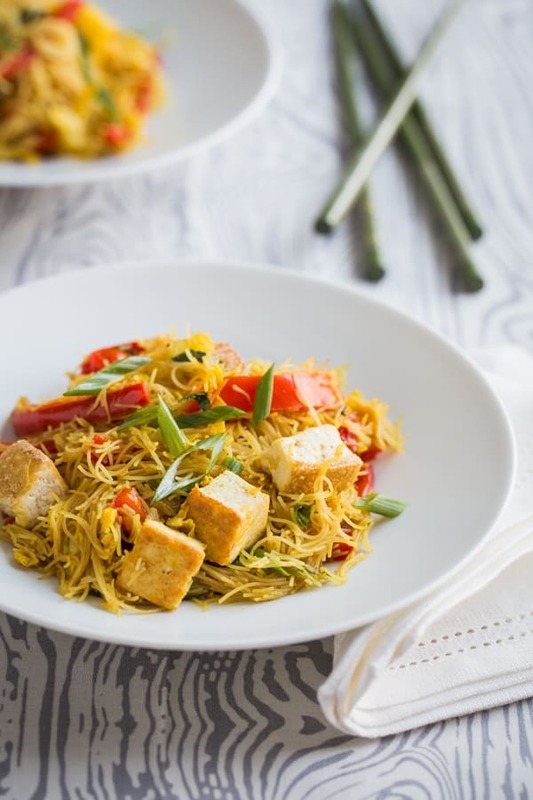 This vegetarian take on Singapore noodles is made with spicy curried rice noodles, stir fried with crunchy napa cabbage and red bell pepper slices. Bring a large pot of water to a boil. Remove from heat. Submerge the noodles in the water and soak until al dente, about 3 minutes (but refer to package instructions). Drain the noodles in a colander and rinse with cold water. Set aside. Separate the white and green parts of the green onions. Finely chop the white parts, then cut green parts into 1-inch sections. Set aside. Heat 1 tablespoon of grapeseed oil in a large skillet over medium heat. Add the tofu cubes and season with salt and pepper. Cook for about 10 minutes, flipping once or twice to achieve browning on multiple sides. Transfer the tofu cubes to a paper towel-lined plate. Add the remaining 2 tablespoons of grapeseed oil and 1 teaspoon of sesame oil to the skillet. Raise the heat to medium-high. Add the white parts of the green onions, garlic, ginger and bell pepper. Stir-fry for 2 minutes. Add the napa cabbage and continue to stir-fry until wilted, about 1 minute. Sprinkle with curry powder and turmeric. Stir fry another 30 seconds, until fragrant. Add the noodles and soy sauce. Stir fry 1 minute more, using a fork to separate noodles. Add the cilantro, remaining green onions and tofu cubes. Use a fork to distribute ingredients evenly and season with additional salt and pepper, if desired. Remove from heat. Divide the noodles onto plates and serve. For a less spicy version, replace some or all of the Madras curry powder with a milder curry powder. For a spicier version, add a few teaspoonfuls of Asian chili paste. My 14-year-old daughter has decided that fried tofu is her favorite food and I’ve got some extra firm in the fridge just waiting for a good recipe. This is truly serendipity! Ive been on a curry kick lately. It is so good. I sometimes get lazy and just sprinkle it on my veggies and rock it out that. This dish is so up my alley!. Looks delish! Thanks Chrysta! This dish definitely set me off on a curry kick of my own! This looks AMAZING! I am going to attempt to make this tonight! 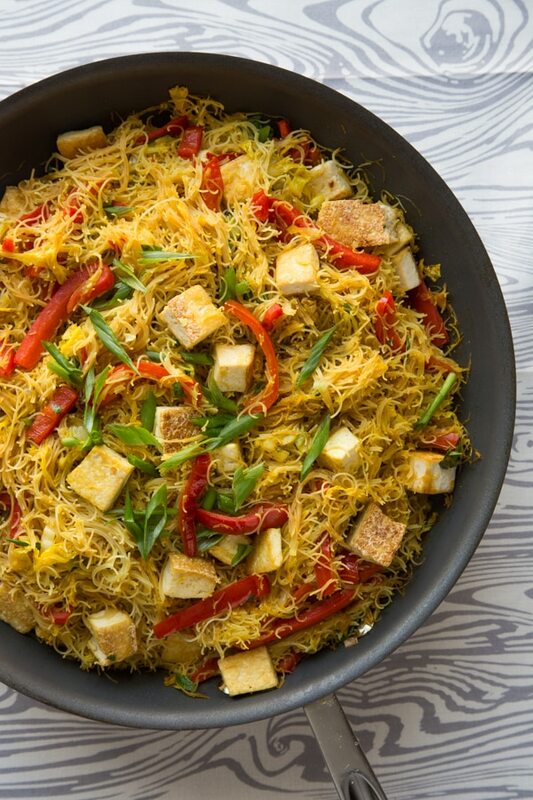 I’m all for cooking with tofu and this plate of noodles with fried tofu looks so tempting! love that you used Madras curry powder! tempting! would love to try! pinned! I’m all about spicy food, so I love the kick it gets from Madras curry powder. I hope you get a chance to try it! Pretty sure I could eat curry powder every DAY and never get bored. I actually don’t think I’ve ever had Singapore noodles though, which is a shame! Must try! yummmmmmm Singapore noodles is an old childhood favourite! Definitely like the looks of it with tofu! I’m sure you’ve got some amazing cuisine in Singapore, and I really hope to get there some day and give it a try! I’m glad that I read this message before I made the recipe. Is it possible to get the nutrition information for the recipes? Hi Kelly! We don’t have the nutrition info on hand, but this is a great tool if you’d like to take a crack at it yourself.